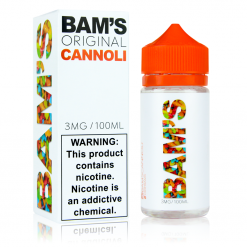 Relatively new, Bam Bam’s Cannoli are a range of cannoli based e-liquid flavours brought to you by One Hit Wonder team. That’s the same guys that brought you Island man and Police Man amongst others. Straight from the mixing labs of One hit Wonder, Bam Bam’s Cannoli bring you four exciting new e-liquid flavours. Original, Strawberry, Captain and Birthday and are amongst some of the most flavourful new e juices to hit the market.